Looking for the name of a SF or fantasy novel. Basic plot that I can remember: Two main characters (probably human, or close) involved in some type of quest (which takes place on a planetary surface, most likely utilizing some type of non-advanced, animal-type transportation - horses perhaps). One character is a woman who has nobility in her background. The other character is her faithful assistant, a male. The novel was quite good, rather long (as I recall), and had quite an impact on me during my younger years. 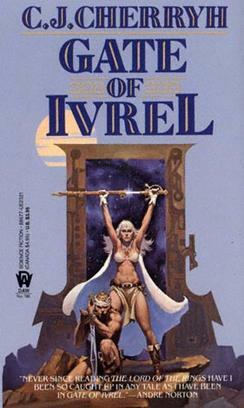 From the description, the story that leaps to mind is Gate of Ivrel and the following books of the Morgaine saga by C.J. Cherryh. C.J. Cherryh is a female author, check. Morgaine is a powerful (not technically aristocratic, but competent, sophisticated and old beyond her apparent years, so able to fake it) woman on a quest to destroy the gate of the title and all others like it. Nhi Vanye i Chya is a young sub-noble (merely a dai-uyo as I believe he puts it) warrior who is outcast from his family and joins Morgaine on her quest. Initially Morgaine merely tolerates Nhi Vanye as a local guide, intending to abandon him when she closes the gate. But they are pursued through the gate, cutting him off from his homeland with no way to return, so she keeps him. Eventually (in later books) she trusts and values him enough to entrust her quest to him in the event she should fall. Not the answer you're looking for? Browse other questions tagged story-identification novel soft-sci-fi or ask your own question. What is the tilte of Fantasy Genre Novel with 2 brothers (the sons of satan), female author?